Integrated with mastery-learning concepts, LIFEPAC 8th Grade Language Arts creates a solid foundation for effective, life-long communication. Worktexts improve your student's' understanding of language and literature, sentence coordination and subordination, and autobiographies. Reviews cover etymology, modifiers, oral reports, and mood and tense. 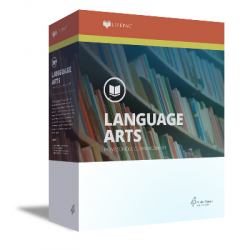 The LIFEPAC 8th Grade Language Arts Set contains ten worktexts and a teacher's guide.